Big inspiration often comes in tiny packages—small enough to fit in your pockets. We’re talking about pocket-style scrapbooking, using 3″ x 4″ and 4″ x 6″ slip-in cards, which has taken the memory-keeping world by storm. From Project Life and Sn@p! Studio to Photo Freedom and Albums Made Easy,* the options for pocket pages have exploded in recent years. And so have scrapbook stashes worldwide. 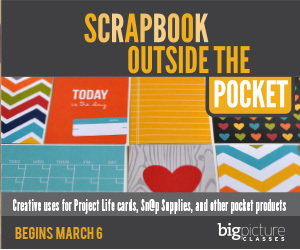 In Scrapbooking Outside the Pocket, a new online workshop from instructor Monica Bradford, you’ll be inspired to put dozens of pocket products to beautiful use on 12 or more standard scrapbook pages and one fun mini-album. You’ll love Monica’s inspiring layout examples, fun mini album project, weekly process videos, and instructional handouts with extra tips and tricks. Not to mention the private message board and gallery in the classroom, where you can trade ideas with worldwide scrapbookers who share your interests. If you’re a traditional scrapbooker, here’s your chance to collect and create with some of the most exciting, enticing, and fashion-forward products on the market these days. If you’re a pocket-style scrapbooker, and you already have enough slip-in cards to last you 10 or more years of pocket scrapbooking, here are some creative new ways to use your stash. Get ready to think outside the pocket with Monica this March! Check it out here..